I just returned from Scottsdale, Arizona, where I attended the NAPO (National Association of Professional Organizers) conference, along with 500+ professional organizers from all around the world. The NAPO conference provides continuing education regarding best practices in the organizing industry, as well as a wonderful opportunity to learn about the dizzying array of organizing products/tools and storage solutions that exist in order to assist clients with their particular organizing challenges. 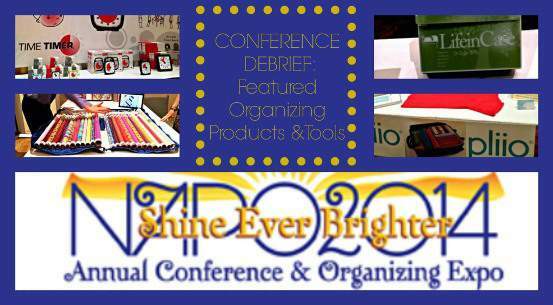 As part of the conference “debriefing” process, I wanted to highlight some of the products I came across at the Organizing Expo. In today’s blog post, I’ll present some great tools for organizing clothing, gift wrapping supplies, and vital documents. 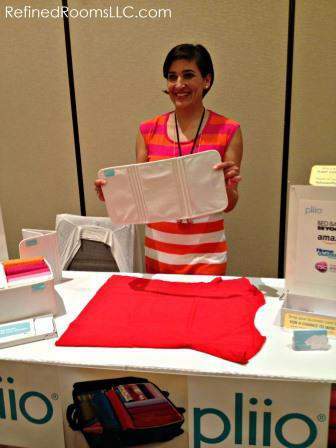 One of the first products I discovered on my foray into the Organizing Expo Hall was the Pliio Clothing Filer. This product totally plays into my OCD tendencies. 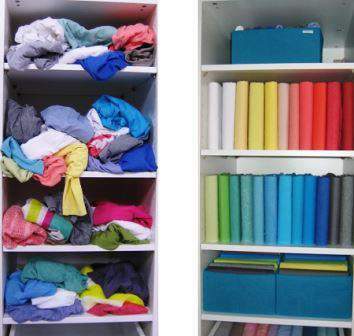 Do you struggle with maintaining order within your dresser drawers or closet shelves? The Pliio Clothing Filer is a tool which makes it easy to fold your clothes and store them in perfectly uniform piles or stacks. This enables you to easily see all of the garments that you own. The structure makes putting away and retrieving clothes effortless. L-O-V-E it! Not only does the Pliio system reign in clutter at home, it is also a useful tool for keeping the clothing in your suitcase uber-organized while traveling. Pliio comes in several sizes to accommodate various types of garments, including children’s clothing. Raise your hand if you have struggled with keeping all of those gift wrap rolls and supplies corralled and organized. I have. For those of you with your hands raised, I’m happy to introduce you to Wrap iT, the all-in-one solution for organizing all of your gift wrap and wrapping supplies. Wrap iT is available in both a regular and a deluxe size. Both options hold up to 26 (yes, 26) rolls of wrapping paper, but the deluxe version can accommodate oversize rolls. There are a number of storage compartments designed to hold gift bags, tissue paper, ribbons/bows, tape and scissors…everything you need to create a gorgeously packaged gift. 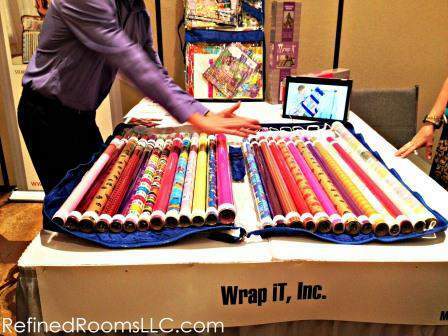 As creator Adam Levine demonstrated at conference, the Wrap iT includes a unique system for storing wrapping paper rolls to prevent those annoying frayed/damaged edges that can often occur when rolls are stuffed willy nilly inside the closet or under the bed. The best part about Wrap iT is that it stores so much in so little space! When hung in the closet, Wrap iT takes up about as much space as a suit jacket. If you don’t want to hang it in the closet, its slim profile enables you to simply tuck it away underneath a bed. I spend a great deal of time working with clients to organize their “paper life”. One of the overriding goals we strive to achieve together is to create systems for easily retrieving important documents (for them or for their loved ones) in the event of an emergency. Whether the situation takes the form of a medical emergency, a sudden death, or a natural disaster, it is crucial for everyone to have a way to quickly find the important documents. 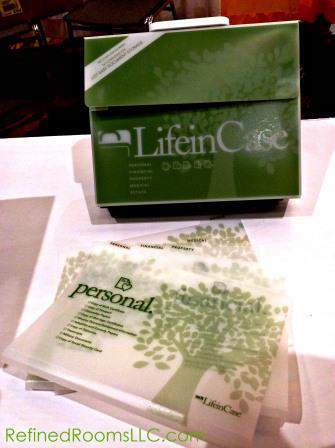 The makers of LifeinCase recognized this need and created a ready-made system that makes it quite easy for anyone to gather their essential documents and have them ready to “grab and go” in the event of any emergency. Stay tuned for the next post, where I’ll be describing cool time management and productivity tools from the NAPO 2014 conference!